Lapointe, Pierre Louis and Claire Poitras. "Saint-Bruno-de-Montarville". The Canadian Encyclopedia, 04 March 2015, Historica Canada. https://www.thecanadianencyclopedia.ca/en/article/saint-bruno-de-montarville. Accessed 24 April 2019. The seigneury of Montarville was originally granted to Pierre Boucher de Boucherville Junior in 1710. The Boucherville family combined the last 6 letters of their name to the first 2 syllables of the French word for mountain (montagne). Saint-Bruno-de-Montarville, Qué, City, pop 24 388 (2006c), 23 843 (2001c), first incorporated in 1958 and reincorporated in 2006. 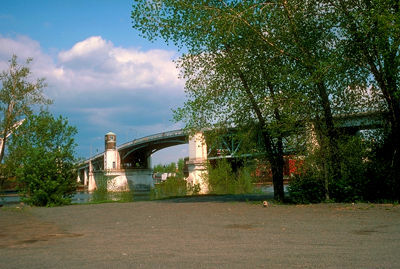 Saint-Bruno-de-Montarville was a borough of the city of LONGUEUIL from 2002-2006 when it then regained municipal status. Saint-Bruno-de-Montarville is a picturesque suburb located about 30 km east of downtown MONTRÉAL. It is nestled on the slopes of Mont Saint-Bruno, one of the Montérégiennes hills. Most of this beautiful mountain is the site of a provincial park. In winter, it is home to the largest and most productive downhill ski school in Québec. The seigneury of Montarville was originally granted to Pierre Boucher de Boucherville Junior in 1710. The Boucherville family combined the last 6 letters of their name to the first 2 syllables of the French word for mountain (montagne). Settlement of the area was very slow, however, and in 1829 the seigneury was sold to François-Pierre Bruneau. His name was given to the Roman Catholic parish of Saint-Bruno, which was set up in 1842. When the area became a parish municipality in 1855, it combined the 2 names. Saint-Bruno-de-Montarville is rich in architectural heritage, the most striking examples are the historic stone mill (1761) and the old presbytery (1851). The community is an important agricultural, residential and commercial centre with a large regional shopping area located along highway 30.